Speedify is more than just a VPN solution that encrypts your traffic to protect your online privacy. Speedify is can securely combine and use multiple Internet connections at the same time on any Windows, macOS, Android or iOS device. This is done software-only, without the need of expensive and bulky hardware devices (and at a fraction of the cost) via our patent pending implementation of channel bonding / link aggregation. It combines all available WiFi, 3G, 4G, and Virtual Private Network (VPN) connections to boost internet speed and reliability. Aside from merging different internet channels and connecting it to their server, the technology utilizes state-of-the-art encryption standards. This allows the software to exceed speeds and connectivity of traditional VPNs. The service also provides security by tunneling traffic to their state-of-the-art VPN server, so that users are safeguarded from hacking and other security threats – even if they are connected to a public WiFi channel. 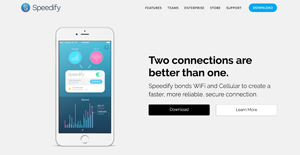 Speedify’s network bonding engine distributes Internet connectivity across PCs, Macs, Android or iOS devices through the software’s global network of 100 cloud-hosted servers. A service of US-based company Connectify Inc., its availability in 23 countries worldwide gives users a virtual IP regardless of content georestrictions. Even if Speedify is not used with multiple connections and just one, its error correction algorithms manage to drastically reduce packet loss, so that the Internet experience on poor wireless networks (such as the ones in trains or on the street) is dramatically improved. By being able to leverage multiple connections at once, Speedify offers users: higher bandwidth, faster speeds and lower latency. It also assures you of reliability and redundancy; if one connection drops, you’re still online as you’re connected via the others. Likewise, Speedify VPN ensures privacy and security as its advanced encryption feature shields users from networks that are not secure. All traffic is encrypted to guarantee that IP addresses, websites, or data sent and received by users while connected to the software are not logged anywhere else. In spite of having strict security attributes in place, Speedify still keeps internet connections as fast as possible. The software’s ability to combine the speed of multiple internet networks all at the same time accelerates connections for smooth media streaming, uploading, downloading, and web browsing. Speedify has the ability to seamlessly switch between networks and can automatically failover to a backup operational mode so that those on the software are always riding on an internet connection. For example, one does not need to cancel an urgent file transfer or restart a video stream since they are always connected even if they accidentally step out of WiFi range. Speedify is useful for those who are on the go due to its comprehensive mobility features that boost users’ productivity. The software has tools that allow users to unblock their favorite applications and services while at an office or school. Users do not need to worry about missing to-dos while travelling abroad as the service can access region-locked content. Speedify is easy to set up, with new users taking as less as 60 seconds to get the software up and running immediately. The ease of use allows one to get up to speed on the technology so that they would be able to accomplish more and not waste time. What Problems Will Speedify Solve? For end-users and professionals, the most common scenario where Speedify kicks in is when doing live streaming, online gaming or accessing the Internet remotely. With its channel bonding feature, Speedify manages to maintain a fast and stable connection for streaming and online gaming. Speedify is used by multiple types of customers, from end-users and professionals to companies and large enterprises. Speedify helps with issues related to improving the available bandwidth, increasing the reliability of the Internet connection and minimizing packet loss and latency. Companies can opt for Speedify for Teams, which includes a management interface for the members of a team. Also, companies and enterprises may choose to implement the Speedify channel bonding technology into their own solutions via Speedify SDK. Large enterprises (especially mobile network carriers and MVNOs) can benefit from Speedify’s hybrid access technology to offload to WiFi via Speedify SDK. If you are considering Speedify it might also be sensible to examine other subcategories of Best VPN Services listed in our database of SaaS software reviews. Since each company has unique business wants, it is prudent for them to abstain from seeking a one-size-fits-all ideal software solution. Needless to say, it would be pointless to try to find such a system even among popular software platforms. The smart thing to do would be to jot down the various important elements that require consideration such as key features, finances, skill levels of workers, company size etc. Then, you should do your homework thoroughly. Read some Speedify reviews and check out each of the other systems in your shortlist in detail. Such exhaustive homework can ensure you discard ill-fitting applications and select the app that presents all the elements you require for business success. How Much Does Speedify Cost? We realize that when you make a decision to buy VPN Services it’s important not only to see how experts evaluate it in their reviews, but also to find out if the real people and companies that buy it are actually satisfied with the product. That’s why we’ve created our behavior-based Customer Satisfaction Algorithm™ that gathers customer reviews, comments and Speedify reviews across a wide range of social media sites. The data is then presented in an easy to digest form showing how many people had positive and negative experience with Speedify. With that information at hand you should be equipped to make an informed buying decision that you won’t regret. What are Speedify pricing details? What integrations are available for Speedify? On iOS, Speedify is integrated with all the major password managers, including 1Password, LastPass, Keeper and Dashlane. Users can login with a single click. Speedify also offers APIs and command lines on every operating system for app integrations. If you need more information about Speedify or you simply have a question let us know what you need and we’ll forward your request directly to the vendor.